Escape room number 3 of our vacation to Colorado Springs was somewhat impromptu. I knew we were going to be in the area, we just weren’t sure we were actually going to go. When we got up to the store front and went inside, the manager, Emily, was very welcoming and told us there was plenty of time after we came back from dinner to do one. We told her we would be back to do the Egypt tomb escape and off to dinner we went. 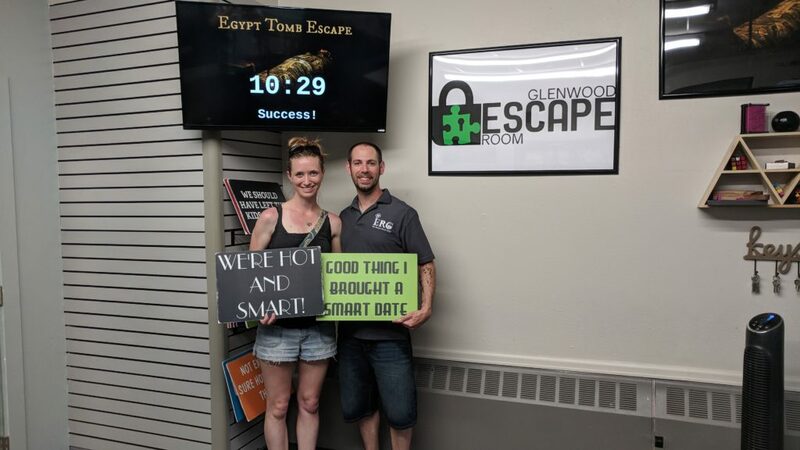 The website provided the basic description of an Egyptian Tomb Escape that I would have expected: enter the tomb, find treasure, leave (AKA Escape). And that is essentially what we got! You are the assistants to an archaeologist who has recently uncovered an Egyptian pharaoh. Unfortunately he’s been run out from the dig site, and has asked you to sneak back in to retrieve something for him. Also unfortunately, grave robbers and other miscreants have found out about the site and are on their way to loot it. They’ll be there in about 60 minutes, so you have to find what your boss asked you to find and get out before they lock you inside to deal with whatever curses there may be. Also to die. The mission was quite clear from the video of the archaeologist. Get in, find the stuff, get out before the looters find you and trap you inside (better known as SAVE YOURSELF!). Rather straightforward with a good sense of urgency. There was a decent mix of puzzles throughout the room. When you walk into the room, you can see that there’s a second room blocked off by a chain link fence. So that’s not a spoiler at all. What I enjoyed most from this room were the more physical, hands on puzzles. There was a puzzle with ropes, another with some… I don’t know, hidden object is what it felt like, but it was a visual puzzle. There were several combo locks, but everything else was some sort of magnetic lock. And the final few puzzles with the actual sarcophagus we’re pretty cool. That was an excellent way to end the room and escape. There were a couple of obvious puzzles that we didn’t really overlook but more so underestimated. For example, the visual puzzle I mentioned earlier took us much longer than it should have because we were just looking at it in the wrong fashion. Same goes for the bag puzzle. Similar to one of the rooms at Pikes Peak Escape Rooms, there was a notebook that gave you the majority of knowledge needed to solve the puzzles. You kept referring back to it throughout the experience, and it was just as well done as the notebook at that other room. Everything was in plain sight, and although not necessarily hidden, also not completely blatantly obvious. This was Steph and I’s second room on our own, and we worked extremely well together in this room for it being just the two of us. Nothing was overly difficult, some things toward the end just clicked for me, but that just speed up our escape toward the end. Difficulty wise, I would say between a 1 and a 6/7. The only thing that seemed out of place was the chain link fence separating the two rooms. Everything else in one way, shape, or form fit the locale. The sarcophagus was beautiful, the way to escape was awesome and fit well with the entire theme. Steph and I had fun in this room and we’re glad we chose this one over the other 2 available (an outbreak style room and something of a whodunit as the third), both of which seemed a little over-done, theme-wise, for me at least. Emily was there to help us along, should we have needed it. We had a couple hiccups/technical issues, but nothing that really drew us back to reality. We got a nudge here and there and a few clarifications (that magnetic bag puzzle for instance). Nothing to really report here. Final Thought: I was pleasantly surprised by this room. Being in a touristy area, I didn’t think the rooms would have been terribly good. This review seems to prove otherwise. Again, there really didn’t seem like there was much to do, but we were occupied at all times and were just into it. If I’m out in Glenwood Springs again, I would definitely consider doing a two-fer and finishing out the rooms there.